In Part 1 of this series, you learned about how body fat testing is a prediction, not a measurement. In Part 2, you learned about underwater weighing, and in Part 3 you learned about the Bod Pod. Now let's talk about BIA. BIA is one of the quickest and easiest methods for predicting body fat. However, the convienience of this method comes at a price of accuracy. BIA involves running a light electrical current through your body. Fat-free mass contains mostly water, while fat contains very little water. Thus, fat-free mass will have less resistance to an electrical current. By determining the resistance of a current running through your body, theoretically we could get an estimate of how much fat-free and fat mass you have. There are many BIA devices out there, including devices by Omron and Tanita. While the theory behind BIA sounds nice, it is problematic. First, an electrical current will follow the path of least resistance through your body. This means that, if you carry a large amount of fat underneath your skin, the BIA won't even hit it; the current will instead pass through internal tissues. Second, I mentioned last week how hydrostatic weighing can be affected by the hydration of fat-free mass; BIA is going to be even more affected by this. And while there is one device that tries to differentiate between fluid inside your cells and outside your cells by sending the current at different frequencies, you still have the problem of the current following the path of least resistance. Third, many BIA devices will miss entire sections of your body. For example, some devices, like Tanita scales, send the current through one leg and out the other, which means your entire torso is missed. Some hand-held devices will send the current through one arm and out the other, missing the rest of your body. And while there is now one device that is able to send the current through every section of your body, it is still limited by all of the other problems associated with BIA. The biggest problem with BIA is that it's a prediction based off of a prediction. When a manufacturer develops a BIA device, the manufacturer gathers a large group of people and determines their body composition using another method. Usually, this method is not the gold standard of the 4-compartment model; most often it is hydrostatic weighing. The manufacturer then takes the results of the BIA equipment, and develops a prediction equation from those results (and variables like the individual's height, weight, and gender). This equation is designed to predict what your body fat would be if we were to perform underwater weighing on you, based on the BIA results. The problem here is that you have error compounding upon error. I already told you how hydrostatic weighing can have an error rate of up to 6% in individuals. Well, now we're trying to predict your hydrostatic-weighing-derived body fat using BIA. And this prediction itself is going to have an error. So we're multiplying the error by making predictions off of predictions. The X-axis shows the difference in fat mass (in kilograms) between BIA and the 4-compartment model. The Y-axis shows the number of people who showed this difference (this study involved 50 people overall). To convert kilograms to pounds, multiply the number of kilograms by 2.2. First, you can see the chart is skewed to the right of 0. This means that the 4-compartment model showed higher amounts of body fat than BIA for most people. Second, you can see some pretty large differences for quite a few people. In fact, in 20 out of the 50 people, BIA showed the people had at least 8 pounds less body fat than they really had. Twelve out of the 50 people showed differences of more than 10 pounds. This chart showed the spread of various body fat testing techniques, as compared to a 4-compartment model, when looking at % body fat. This spread represents 2 standard deviations, which means that 95% of the subjects fall within this spread. I just want you to focus on BIA. You can see that BIA had the biggest spread of all of the techniques. This spread was around 8% in both directions. This means the error rate for BIA in this study got as high as 8% when looking at most of the bodybuilders. What About BIA For Measuring Change Over Time? I've heard people make the argument that, while BIA may not be that accurate, it should work fine when tracking change over time. The theory, they say, is that the error should be the same each time you use it. The problem is that this isn't true. As I mentioned in the article on hydrostatic weighing, the density and hydration of fat-free mass can change with weight loss. If this can affect the accuracy of hydrostatic weighing for measuring change over time, then you can be sure that the effect on BIA outcomes is going to be significantly larger. Researchers have looked at the accuracy of BIA for tracking body fat change over time. 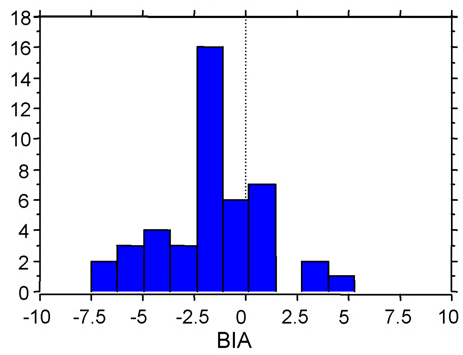 In one study, the disagreement between BIA and the 4-compartment model ranged from -3.6% to 4.8% for measuring change. This means you could lose 3.6% body fat, but BIA would show no change. Or, BIA could tell you that you lost 8.8% body fat when you really only lost 4%. In fact, in this study, plain ol' bod mass index (BMI) did just as well as BIA for predicting change in body fat, except for in one person. Chart showing the difference in body fat % change between various methods and a 4-compartment model. Each bar represents 2 standard deviations or 95% of subjects. 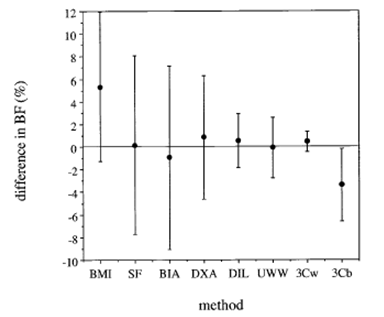 Again, you can see BIA had the biggest spread of all the methods, even bigger than BMI. The error rate got as high as 8%, and that's for detecting a change over time. So one could lose 4% body fat, yet BIA might show an increase in body fat of 4%. The x-axis shows the difference in fat loss (in kilograms) between BIA and a 4-compartment model. The y-axis shows the number of people with that difference. The chart is heavily skewed to the left, meaning most of the people lost more body fat than what BIA indicated. Twelve out of the 50 people lost over 5 more pounds of fat than indicated by BIA, and a few people lost around 15 more pounds of fat than indicated by BIA. The fact that BIA underpredicts fat loss in most people is not surprising. As I mentioned earlier, the electrical current of BIA won't even pass through fat underneath your skin, so you could lose a lot of fat and BIA won't detect it. In fact, the only reason BIA will even show a loss of fat is because you lost weight, and weight is a component of BIA prediction equations. This is why BIA doesn't do much better than BMI in some studies. My own clinical experience with BIA verifies this. In the clinic for which I used to work, we had large weight losses. Our clients were losing nearly 40 pounds on average, and we had 400 people in the program at any one time point. Yet, occasionally we would have a client who lost a large amount of weight and experienced a large decrease in circumference measurements, yet showed an increase in body fat % according to BIA. It did not happen very often, but it did happen. When it did happen, it was psychologically devastating to the client; we sometimes would have a client cry over it. We would try to explain to the client that the BIA can be highly inaccurate, but the client would hang onto the number rather than looking at weight and circumference measurements (which told the real story). Most of these clients were Microsoft employees, so they tended to be very "hard numbers"-oriented individualls. I actually campaigned to do away with BIA completely, but Microsoft (whose insurance covered our program) required us to measure body composition. So one change we did make was to drastically reduce the frequency of BIA measurements, taking a measurement only before and after the program, rather than every 5 weeks which is what had been done before. This helped reduce the problem, but did not completely eliminate it. BIA can be problematic because it's a prediction based off of a prediction, so the error gets compounded. 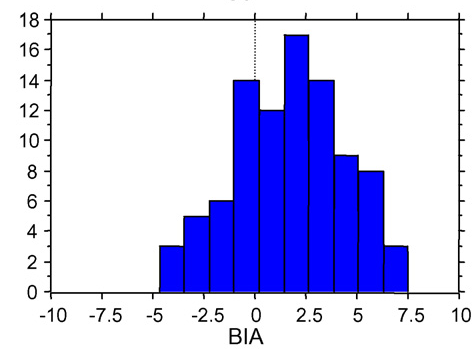 When you look at group averages for BIA measurements, there tends to be bias, with BIA often underpredicting how much fat you have. As with other techniques, the individual error rates can get high, with some research showing error rates of around 8-9%. 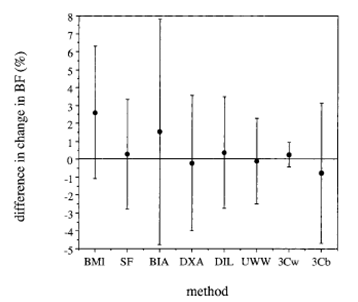 In fact, BIA doesn't do much better than BMI at predicting body fat in some cases. When it comes to measuring change over time, BIA can often underpredict the amount of fat loss, and the estimated change can be off by up to 8%. For all of these reasons, I am not a fan of BIA for measuring body composition in individuals. If you are going to use BIA for tracking body composition over time, I recommend very long time intervals between measurements (at least 3 months, but 6 months is probably better), as the error rate for BIA can be larger than the changes in body fat in you see. Whatever numbers you do get using BIA, always remember they are very rough predictions....and I emphasize very rough. Você arrasa!! Sou fã do seu trabalho, parabéns!